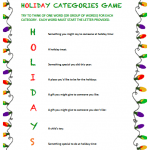 Have some Fun with these Holiday Word Games! Climb the ladder to transform one word into another by changing one or two letters at a time. 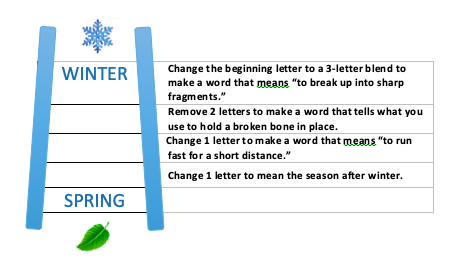 In the example below, change WINTER into SPRING in only four steps! Click here to get the answer and download more Holiday Word Ladders, including one developed especially for HIP by Dr. Tim Rasinski. Not challenging enough? Remove the clues! Better yet, have your students create their own Word Ladders. Hinky-pinkies are riddles for which the answer is a pair of rhyming words. What is a lone bell? 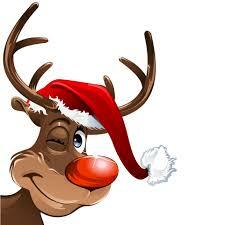 A SINGLE JINGLE! A nice evergreen? A FINE PINE! And if that pine doesn’t cost anything? Then it’s a FREE TREE! Mad Libs are word games in which players insert original words into a story template. The result is often nonsensical and usually comical! And the bonus is that kids learn a few things about parts of speech, sentence structure, fluency and other language elements. 3. Then provide each student with a copy of the “cloze” variation of the song. They are to insert the words from their list, in chronological order, into the blanks in the story (usually with resulting hilarity). Of course, the best part is reading/singing their crazy pieces aloud to their friends. They won’t even realize how much they’ve learned! Just like in the commercial Scattergories™ game, players are given a time limit to generate a word that starts with a designated letter for each category. Points are scored only for words that no other player has given. Read more about Vocabulary and Word Study.